Adding to its friendly tournament silverware (should friendly tournament silverware be construed as plasticware? 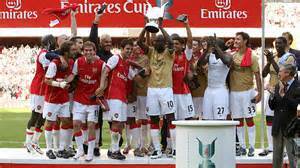 ), Arsenal won the Emirates Cup. The first game on Saturday against Lyon went quite well, with Arsenal winning 6-0. Arsenal looked zippy and energetic, and there were six different goal scorers. Today’s match was not quite so engaging, with Arsenal beating Wolfsburg 1-0. Theo Walcott scored the lone goal. A weaker team was fielded on Sunday, but both games included a mix of seasoned and young players. The young players look pretty amazing: still, it’s reasonably clear they all need to bake a little while longer. Arsenal’s defensive frailties went unexploited by some woeful shooting by both Lyon and Wolfsburg, and there were certainly some moments to learn from in both matches. Click here to view Walcott’s goal against Wolfsburg. The friendly season is over and it’s on to serious footballing business. No more Mr. Nice Guys. Well, ok, next up is what Arseblog called a “glorified friendly.” Let’s emphasize the glorified aspect of the description. As I’ve alluded in my Leagues & Cups page, FA Community Shield isn’t perhaps the most serious competition in the world, but nonetheless we’re playing Chelsea. Jose Mourinho and Arsene Wenger, mano a mano. It would bother Jose a lot to lose to Arsene; therefore, doing our best is a most worthwhile exercise. It would bother Arsene to lose to Jose but (fortunately or unfortunately, you call it) he should be used to it. Jose probably can’t park the bus; it’s just one game; he may just have to go for it. Although it might be a better game if it happened later in the season or meant more, there’s reason to believe both teams will field the best teams they can, notwithstanding some players still out on vacation after late national team competition during the summer. Both teams will want to win it. And no matter how you look at the competition, it is another milestone that must be crossed before we can start the season. In my personal buildup to the season, I found myself wanting during the Emirates Cup. Our cable went out yesterday and we missed the last 10 minutes of the Lyon game. This morning, I missed the first few minutes of the Wolfsburg game in transit from church and got distracted from the beginning of the second half and missed the Walcott goal. These are the kind of kinks that must be out of my system by the time the season starts. Nothing but perfection will do.